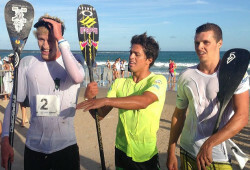 A small but elite field of young talent has launched the 2014 Stand Up World Series in Brazil this weekend, with Connor Baxter drawing first blood by making it a clean sweep of both the Sprint and Long Distance races. Meanwhile on the women’s side it was Angie Jackson all the way, with the reinvigorated Aussie proving too strong for a select group of local and international paddlers. The Connor/Kai rivalry, the recurring theme of the 2013 Series, returned on Day One of the Alagoas Pro, with the two superstars battling all the way to the finish line in the sprints. Connor got the win by half a second, while one wave further back was Aussie Jake Jensen, a paddler that I (and many others in Australia) have tipped to be one of the World Series title contenders this year. Coming home 4th was Zane Schweitzer, while rounding out the top 5 in the sprints was the Danish Viking, Casper Steinfath. Day two (Sunday) saw the Distance Race and while many would have predicted a Kai/Connor battle, it was clear that Connor’s pre-season training has been better, with Kai fading badly over the distance to limp home in 10th. That result, combined with Kody Kerbox’s stellar runner-up finish and Jake Jensen with another third place, saw Kai knocked out of the top three overall and needing to improve fast ahead of next week’s Abu Dhabi All Stars. Zane Schweitzer picked up 4th place in the Long Distance race to match his result from the Sprints on day one, however a slight anomaly in the new World Series rankings meant that his 4th + 4th (11,500 points) wasn’t as good as Kai’s 2nd + 10th (11,750 points) in the combined result. So that puts the final event standings (and early season title rankings) at: Connor, Jake, Kody, Kai, Zane.